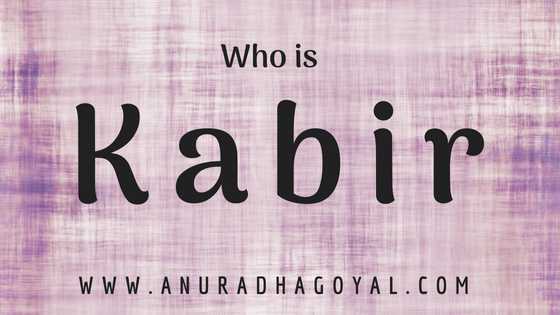 Kabir was a weaver poet who lived sometime in the late 15th early 16th century. This was the time of Bhakti movement in India. Politically the Islamic rulers were gaining ground across the country and Hindus were getting subjected to many atrocities. It led to the Bhakti movement when they all turned to God, singing his praises and seeking solace in him. Debate on whether Kabir was a Hindu or a Muslim will probably never get settled. Muslim couple Neeru & Neema who are buried in the Kabir Math at Banaras brought him up and Swami Ramanand was his Guru. His works show a deep knowledge of many disciplines including Vedic literature, anatomy, flora, fauna, philosophy and of course weaving. Kabir’s poetry comes in various formats – Saakhis, Shabads, Ramainis, Ulat Bhashis, and Basant. Origin of the world Saakhi is Sakshi that means ‘as seen’. These are couplets that Kabir probably uttered when he saw something that sparked a thought in him. In most of these Saakhis, we see a visual and a thought or a pearl of wisdom combined together. Since most of the works passed on in oral tradition, in various versions we find some her-pher of words. For example in poem Paani mein meen pyaasi – some people sing Mohe sun sun aave haasi and some people sing mohe dekhat aave haasi. Though the meaning and intention of the poem have not changed but the words sometimes change. While referring to himself Kabir often calls himself Das Kabir, but when he is sung now, Sant sometimes replaces Das. When you hear the same poem being sung by Malwa and Rajasthani singers, common words are replaced by the local words and the same is true for urban singers who replace words by Sanskritized Hindi. He is a Dhara or a flowing river– not a single person today. He started a thought process and many other streams have come and joined him. We would never know what he said and what was added to his poetry later, and that does not matter as long as the thought process is the same. His poetry is profound – but still folk and not classic. To me, first of all, Kabir is a Fakir. Now colloquially we understand Fakir as a beggar but the meaning of Fakir is really someone who is independent of anything he has or not has. Fakir is someone who in his capacity can have much but chooses to live with the bare minimum. He is not influenced by any societal pressures and hence is totally free in his thoughts. What distinguishes Kabir from the rest of the poets is his Bhakti was Nirguna. All other poets were saguna poets, that means they saw God in some form or the other. Meera Bai and Surdas imagined God in the form of Krishna while for Tulsidas it was Sri Ramchandra. Kabir was potentially the only one who did not follow a form, his calling was without a form, but omnipresent in every human being. Kabir constantly asked people around him to look inside them. He tries to introduce them to their inner divinity while they are always searching for it outside. This is nothing but the Advaita philosophy that says the Brahman is within you or you are Brahman. Do not go looking after the ultimate reality outside you. Throughout his poetry, Kabir directly addresses the people around him, unlike other poets who talk to others through God. Kabir addresses the man straight and direct. He calls him Saadho – or a good person, Bande – or man, a friend, a brother – every time he established a relation between two human beings. He never addresses others as someone above him or below him except when he refers his Guru. He subtly through his address communicates the equality of everyone and it also comes across in many of his works. He even looks at mundane things and establishes an equal relationship with them like when he says: Maati Kahe Kumhar se…he is saying it is just a cycle, today you trample the soil, tomorrow it will trample you and the cycle will go on. Today we may think we are powerful over others while it is just a matter of time that tables can turn and we may be on opposite sides. Equality of everyone and almost everything in the universe is a continuous theme in Kabir’s poetry. He also believes in the cyclic nature of relationships that keep changing hands but not many are able to see the cycle. The biggest message that I could find in his poetry is that each one of us had God within us, and for every problem, the solution lies within us. He constantly and persistently pushes you to look inside you. He sometimes negates everything you do to reach that so-called God and then tells you that he is right inside you if you have faith in him. tera sayeen tujhme hai, jaag sake to jaag. Moko kahan dhoonde re bande, Main to tere paas mein…. Kabir’s poetry comes from his direct experience. Though he refers to Ved, Puran what he says is his own experience. He gives example from everyday life of his times. He lived as a worldly man, he worked and earned his living and he was a seeker. He did not live on the alms given by others so he understands the joys and pains of earning your own living. This indeed gives him complete freedom to say what he wants to say. He lives within the society so he can see it from within but at the same time, he is detached from it so he can be an observer also. je ghar phookyaa aapno, chale hamaare saath. In a lot of his Sakhis and Shabads he asks you to go by your direct experience, to test what others are telling and not blindly believe what you are told, including the Guru – who he believes is the must get the Gyan. He tells us to live effortlessly. Since he believes everything is within us, every force, every possible energy source, we need not make an effort to look for it. Sahajata – or effortlessness is another theme that repeats throughout his works. It shows that people were making the unnecessary effort even during the days of Kabir, but this is very relevant today as we are engaged in making an effort that we do not even understand why we are making. We are running even to stand in the same place. What we need is this sahajata in our attitude that would make our minds and hence our lives simpler. He denounces organized religion of any kind – he had the courage to speak against or question Islam when they were ruling the place and Hindus in their very Garh in Banaras. Sometimes he tells like a doting parent taking simple analogies and sometimes he hits you hard with his questions. He is always teasing the Pandits, Maulavis and all those who claim to be wise or gyaanis. His tone gets challenging most of the times as if inviting to prove him wrong. Kabir refers to the human body as ghat or a clay pot again and again. It can be interpreted at multiple levels. Physically, it is made of earth and goes back and merges with earth. Metaphorically it is an empty pot and it is up to the human what he fills it with. What is a human is defined by what we will fill this pot with? He finally says for a human being everything is within this human body – the good, the bad, the ugly and even the God. Maya – is something Kabir calls the root of all evils, a dakini that can create illusions in which not only humans but even Gods get lost. He says this world is nothing but the illusion created by Maya and to see the reality you need to get yourself out of the net of Maya or Mayajaal. While he talks about Maya, he also talks about each of us being all-alone and the need to understand this. Finally, death is another theme in his poetry, but not as an end but as the only reality of human life. In fact, Banaras is called the city of death and a city that celebrates the death and we see the same thought process in Kabir’s work as well. He time and again talks about the momentary-ness of life like the water on an upturned pot…and hence no point in getting attached to it. He speaks of human nature with the perspective of death in place, of the futility of a lot of things that we do thinking we are going to live forever. He wants us to remember that ultimately it is the death that we have to embrace – like it or not and live our live keeping death in view. Come with me for an exploration of Kabir – a thought that is as simple as it can be and as profound as it gets. Previous Article← Celebrating Failure? Really!